A young American woman named Julie (Scout Taylor-Compton) is haunted by an angry spirit after she is tricked into desecrating an ancient Thai shrine known as a Ghost House in this thrilling movie of the same name. Ghost Houses are located all around the Thai landscape and regarded as sacred. According to lore, they offer places for those who have passed to occupy themselves so they don’t bother the living. Julie and her boyfriend Jim (James Landry Hebert) are on a special vacation in Thailand wherein he aims to ask for her hand. But things take a haunting turn after they meet two British lads with a more nefarious agenda. Immediately after taking a small effigy wrapped in cloth from one of these niches, she becomes possessed by a vengeful, scorned crone who happens to hate young women because they remind her of her cheating husband. Burned to death in an act of her own vengeance, the spirit is scarred and hideous as she makes frequent appearances at unexpected times. Look for a creepy scene involving a digital camera and a photo scroll. Early on, local spiritualists are able to expel the ghost from Julie’s body, but it’s not over. The specter is determined to repossess her and there are only three days in which to make sure that doesn’t happen because if it does, there is nothing anyone can do and Julie will cross over for good. Ghost House is the Taken of the supernatural realm as Julie’s fiancé does everything he can to expel the curse with the help of a local taxi driver named Gogo (Michael S. New). During this time Julie slips in and out of the spiritual world while the ghost does the same. Rich Ragsdale is at the helm of this very effective and moody horror movie. He’s got the goods as far as his cinematographer, Pierluigi Malavasi, who never wastes good lighting or storybook location scenery, and the score done by Ragsdale himself creates an atmosphere of melodic haunts. With Ragsdale locking in those two elements with effective results, the rest is left to his cast which we all know can be hit-or-miss in these movies. Luckily for us, Ragsdale keeps them focused and convincing. Taylor-Compton as Julie is non-perfunctory. She goes from confident and self-actualized to haggard, disoriented and genuinely terrified. It’s this dedication to the character that sells a big part of the movie. James Landry Hebert as her fiancé Jim makes realistic choices to help Julie recover as they go from real life applications into the depths of incorporeal first aid. This is also a travelogue of exotic Thailand and is filled with local characters who don’t turn off their accents or traditions to meet with the PC police of the west. This isn’t homogenized filmmaking; you get the location, you see the people who live there too. Ghost House makes no attempts at redefining its Tartan Asia Extreme roots, but the soil in which it’s planted is rich with talent, a beautiful score, stunning cinematography and an engaging story. The result is an overall experience ripe with satisfying supernatural low-hanging fruit. 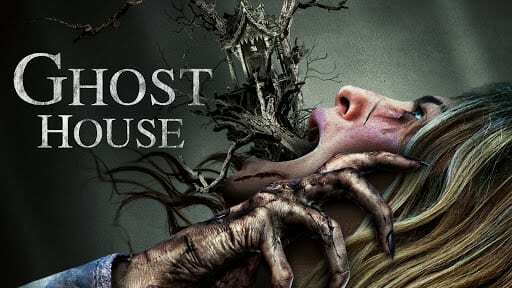 Ghost House is currently available to rent or buy on Amazon or iTunes and other streaming services.